Use improv to unpack the power of labels and stereotypes. 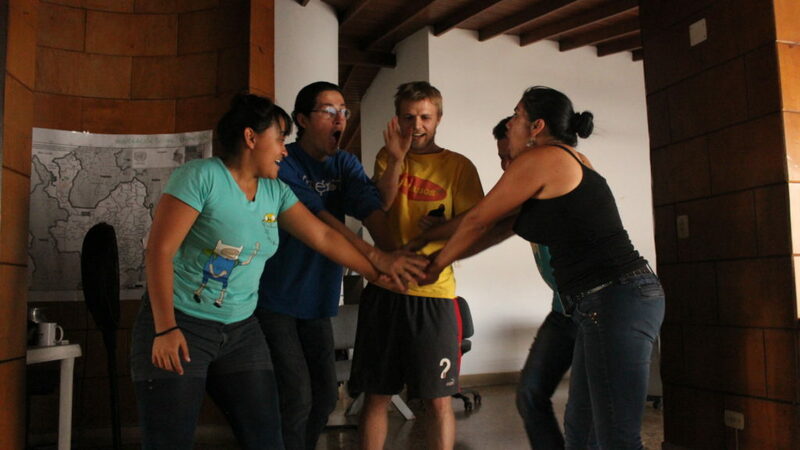 We started playing with this exercise in the rehabilitation centers of Esmeraldas, Ecuador. We were trying to understand how youth participate in their community. The young people we were working with had been pulled to violence, drug use and unintended pregnancies. In the rehab centers, we met young people full of wisdom and in a space of deep self-reflection. And yet, for many that was the 4th, 5th, even 13th time they were back in the center. Why? One thing that rang true for most was the rejection they faced when they went back home. They felt judged, misunderstood and eternally labeled as something they were trying so hard to move away from. We ran this Stereotypes Improv exercise as a way of airing some of those experiences and confronting those labels. It’s got social theatre written all over it. We can’t pin down who came up with it first, but Susan Goldstein writes about it in the power of stereotypes. We’re trying to understand the different labels that young people engage with in their day-to-day life. The exercise helps the group identify and reflect on the stereotypes imposed by their peers, family, or other authority figures. Understanding what kind of labels young people are resisting or embracing can be an interesting way to understand the challenges, culture, and visions of the world the group holds. By understanding how young people relate to the stereotypes they face, you can collectively raise the awareness of the group around the power of labels. It’s a first step towards building more self-aware individuals. This exercise also generates a reflection around how the language and attitudes we choose can enable or hinder our learning process with communities. Ask participants to form a circle and close their eyes. As they keep their eyes closed, kindly ask them to reflect back on any labels, or stereotypes they have come across in their life. Ask them to think about the stereotypes they face now. They can be negative labels, they can be positive, or they may not have any particular emotion attached to it. Allow them to also think about where those labels are coming from. Are they given to them by friends, people their age, from authority figures, from society as a whole? *As this happens you or a co-facilitator can be distributing 3-5 sticky notes in front of each person as well as pens/markers. All markers should ideally be the same kind and color to maintain anonymity. Ask them to open their eyes and write one label/stereotype per sticky note. Encourage them to use key words/adjectives [not sentences]. They should not be writing their names. Once their done, gather all the sticky notes. Ask for 3 volunteers. Having looked through the sticky notes, you should pick 3 stereotypes that would contrast well in an improvisation. Once the three volunteers are on ‘stage’ (in the middle of the circle), you explain that each of the actors will have a label stuck onto their back. They won’t know their own label, but they will be able to read the label of the other two actors. Their only instruction is to interact with one another, treating each other based on the stereotypes pegged on their backs. The actors begin to interact with one another in the middle of the circle. You can stay at the edge of the circle. When the improv has gone on long enough to get a feel for each of the stereotypes, you can end it. Then you’ll ask for another 3 volunteers and repeat the exercise for a couple more rounds. How did you feel addressing the actors based on their stereotypes? How did you feel being threaten by others based on a stereotype? What kind of responses did we see to the stereotypes? Submission, resistance, etc. Do these labels have power? How do youth relate to them? Gives you a feel of what are the perceptions towards young people. It allows people to more experientially break down these labels. Working with stereotypes can be delicate: it is important to state before the improv begins that, although we are likely to be provoke one another in the improv, we also want to make sure we don’t go too far. Anonymity is important in this game so that people don’t feel put on the spot. That’s why we encourage the use of the same color marker on the sticky notes and that no names are used. We’ve adapted the technique to talk about stereotypes around gender, for example. Depending on the research and the group you have gathered, you might want to create a specific category that allows the stereotypes to relate directly to the common experience of people in the room. Try to balance the kind of labels you pick for the improv. For example, you might want to mix up different types of stereotypes – some positive and others that might be more negative. It’s valuable to explore how the oversimplification of labels can go both ways. Avoid concluding with judgements on what labels are ok or not.